The pork belly is a truly magnificent cut of meat. Every preparation results in something amazing whether it's cured into bacon or pancetta, roasted until the skin is shatteringly crisp, confited then deep fried, or braised until it literally melts in your mouth. Red cooked pork belly was one of my childhood favorites. I can still remember sitting at the tiny dining table in my grandparent's Shanghai apartment marveling at how a bite contains a perfect trio of rind, fat, and meat. Red cooking, hong shao, is a common way of braising meats in Shanghai, and the neighboring provinces of Jiangsu and Zhejiang. The color and deep flavors of red cooking comes from the use of dark soy sauce, which is thicker, richer, and sweeter than regular light soy sauce. Pork, chicken, beef, duck, even fish and tofu can be cooked this way but if you choose pork belly, you will be rewarded with something especially delicious. The rind is a deep reddish-brown, the thick striations of fat are soft luscious, and the meat is unbelievably tender and flavorful. The belly is best enjoyed with some white rice and sauce made from the braising liquid. Serve it with a light side dish such as simple stir fried bok choy to counter the richness of the belly. You can also braise some eggs with the pork for some very flavorful braised eggs. If you plan on braising eggs with the meat, hardboil and peel your eggs first. Bring enough water to cover the pork belly pieces up to a boil in a dutch oven or saucepan. Add the pork belly and boil for a minute. Drain the belly pieces and rinse off any scum on the meat and saucepan/Dutch oven. In a saucepan or Dutch oven heat a tablespoon of oil over medium and stir fry the ginger and green onions pieces in the hot oil. When the oil smells fragrant add the pork belly, peeled hardboiled eggs if using, dark and regular soy sauce, wine, sugar, star anise, and enough water to cover the meat. Bring up to a boil then lower to a simmer. Simmer for about 2 - 3 hours or until the pork is fall apart tender. Skim the fat off the top or chill the sauce in the fridge to solidify the fat. Reduce the sauce by half until it has thickened and is syrupy. Drizzle it over the pork belly and rice. 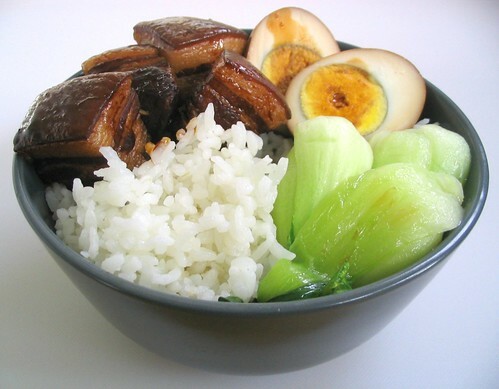 Serve the pork belly with some white rice and stir fried baby bok choy. Also one of my favourites, thank you for sharing the recipe, I look forward to trying it. Yum, what an amazing recipe that makes me feel at home. You have so much talent Amy. My mom makes it just the way you do, but my dad (who is Vietnamese) adds coconut soda! Strangely, both recipes taste identically. If I were a pork eating person, I'd go right for a dish like this one. Can anything else be red-cooked? Do you know the major diff. btw what you have cooked and Dong Po Rou? I read somewhere that Dong Po Rou is also a Zhejiang dish - or am I wrong? wah...I haven't had this for a long time. This reminds me of my mom's cooking. I love this with porridge. SO yummy. Sorry about the late responses everyone! Mmm sounds great with porridge! We do it the same way in the Philippines. I love this dish! Forget about cholesterol! I made this today, and it turned out delicious! Blogged about it as well... Thanks Amy! This really looks good, but I just find Pork Belly is very fatty, so its not my favorite cut. Hmmm Pork Belly not the best cut,even though this does look good. wow, i was searching for a recipe that had proportions (as opposed to my dad's version of this a little this, a little that). i am making this for chinese new year and my kitchen smells heavenly. this pork now actually tastes like my dad's. thank you thank you! I love all of your chinese recipes, I grew up eating all of these delicious foods and love that you have posted the recipes. thank you! !